When I was provisioning I bought some hamburger, pork chops and a big ole pack of chicken tenderloins - (nevermind that I'm mostly vegetarian and Mark will eat whatever I plop down in front of him). It only took 2 weeks. Cruising on down the ICW - Daytona, here we come! We woke up in St. Augustine this morning and took advantage of the hot showers and free wifi again (I actually grabbed the SHAMPOO this time.) As we were gearing up to head out, we saw a pretty unfortunate un-docking. And lord knows I've had my fair share of docking mishaps, so I'm not going to go into detail, but let's just say there was some screaming like a little girl, and eventually a crunch of a bow that looked/sounded like structural damage. 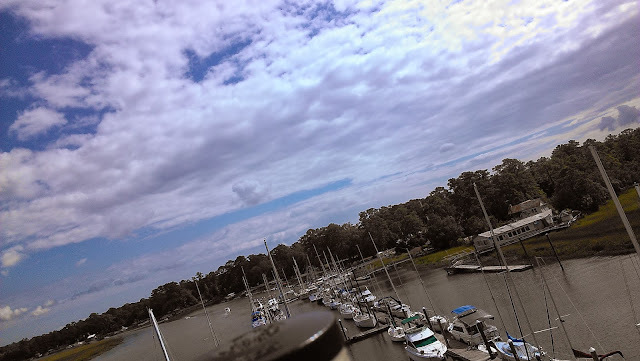 St. Augustine Florida - anchor's away! 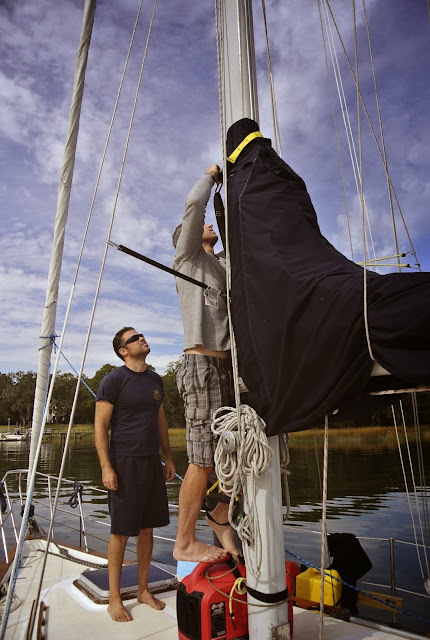 We lifted anchor this morning (Thursday) and headed south a bit to the St. Augustine inlet, via the ICW. There are horror stories about this inlet, and I'm sure on a choppy day, the rumors hold true. We say that around here a lot. It's Wednesday, however, and we are heading south towards St. Augustine in the ICW (Intracoastal Waterway). 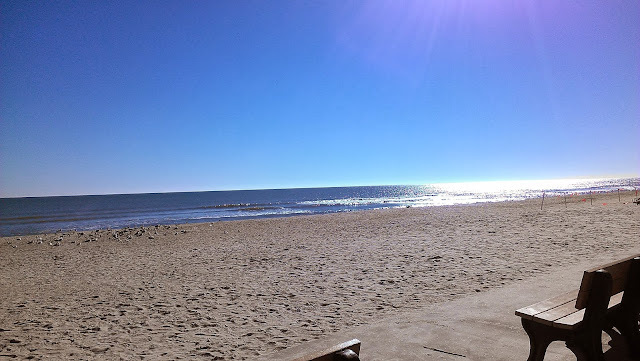 Fernandina Beach/ Amelia Island - day... 4? Boy. This has been a rough one. We set off this morning to calm waters and light winds. We made it to St. Simons Island very quickly - we thought we had a few hours minimum, but were obviously closer than expected after winding our way down the ICW last night to search for anchorage. Our anchorage turned out to be perfect, by the way. Best night of sleep we've had so far. Number 2 - our 2nd day south! We slept halfway decent, considering it rained most of the night. We knew we didn't really need to leave before 9am due to projected rain, and that's about when it ended and we headed out. Seas were much calmer today. We headed to the boat Friday morning with the last of the clothes and food. I headed up the mast to replace both the anchor light and the steaming light bulbs. So we did it. We set sail for 3 weeks! Our first trip longer than an over-nighter - and we don't really have a plan. Yep. We are plan-less. But that doesn't mean a lot of planning didn't go into this plan-less adventure. Per request, here's that promised post for tomato bisque! Have you seen these videos? If not, you're either living under a rock - or out to sea on a boat. Either way, the series has been making the rounds for a while. And as a lifelong southerner (well, anywhere from Oklahoma to the SE Ga coast), I'd like to say they're silly stereotypes that are demeaning to women and only work to further the belief that a Southern accent is equal to a low IQ. But I'm too busy laughing. That's how I spent my Friday, scraping the bottom once again. I have always been a confident SCUBA diver, but with the strong currents, near zero visibility, close quarters with other boats, the dock, oyster beds, etc. I am still not totally comfortable while doing this wonderful chore. Boat Food! - Chicken &/or Veggies and Dumplings. It's a one-pot wonder on a cold, blustery day. And this weekend was a perfect day for dumplings. This is for chicken and green bean (weird combo, right? But it was good!) dumplings, but I'll add info below for veggie/vegan/gluten free changes. Yep, there's been water in the bilge. Actually - we've had water in the bilge since right after we bought the boat. I cannot for the life of me remember where that quote is from. And I'm heading off to teach some yoga and TRX, so I either have time to Google or blog. Choosing blog. Clearly. Can you tell me what it's from? Did you read that post last week? You know, the one about the chart plotter taking a nose dive mid-sail? Mark worked with it - checking wires, looking for corrosion, etc. It would flash on, then die again. We finally accepted the fact that it's 10 year old technology and we need to move on. That resulted in a week of technical research. And the resulting paralysis of information overload. We NEED a chart plotter. We sail this boat based on technology. We know our local waters, but are heading south in a month. Sure we have an ICW chart book that shows us stuff, but it's from 2007, I think. And as much as people have insisted that we need paper charts, the electronic versions are much more up to date. Plus I'm a sucker for computerized anything. We also really want to upgrade to radar. Luna Sea came with loads of great equipment - solar panels, an Epirb, life raft, (relatively) giant fridge/freezer, AC/heater, etc. But if we're going to take her across an ocean, I'd feel a lot better on night passages knowing that we can see what's in our path. As we NEED the chart plotter and WANT radar, we need two that are compatible. We ended up landing on a Garmin chart plotter/radar combo. We'd gone to West Marine to touch and feel and experience the various chart plotters in real life - and while the boat is currently loaded with (old) Raymarine technology, we both feel that the Garmin electronics are much more user friendly. 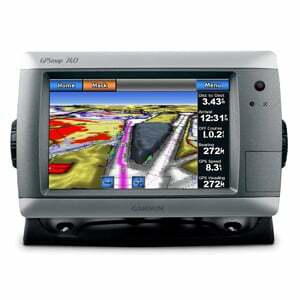 AND West Marine currently has a chart plotter/radar combo on sale. So we did it. Mark loaded the online shopping cart with the combo, binoculars, and a hand held VHF combo pack. I don't know the total cost but he groaned a bit when the cart hit the $2000 mark. But hey - that's a lot less than the potential damages caused from running aground in unknown waters and it's a solid starting point for us as other pieces of equipment die - as I'm sure they will. We can add on to this system, slowly (hopefully not all at once!) replacing the remaining systems with compatible Garmin electronics. For now, our current depth sounder/speedometer is working fine, so it stays. I don't know that we'll get the radar installed before the December trip, but that chart plotter installation is happening as soon as it shows up in the mail. As is the davit installation - likely all arriving at the same time to create a giant pile of projects next weekend. As much as we hate to spend money, it IS why we bought the boat long before our plans to set sail - we can afford to replace things and leave with the safest boat possible. And we'll have plenty of time to learn the new systems, to boot! You guys have any experience with this unit? Luna Sea makes a new friend. 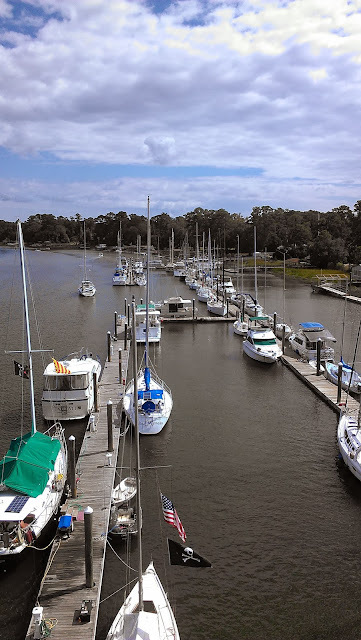 We've had a few boats stop in and drop anchor just across the creek from Luna Sea over the past month. It's a quiet (free!) little spot that is close to ocean access for people to hang out in as they head south. This past weekend we had the pleasure of meeting John and Cassie from Topanga. (you can check out each of their blogs via the link attached to their names.) These guys are a little younger than us - which we're learning is a bit of an oddity in the sailing community. People tend to wait until retirement to leave their jobs and go see the world. But over the past couple of years I've noticed more and more blogs written by younger couples. It's nice to know we won't be the only crazy people to leave our perfectly safe jobs to go traipsing around the world, Christopher Columbus style. Anyway - John and Cassie and their adorable dog Dexter dropped anchor Saturday night and headed over to Luna Sea for some dinner and drinks. It was great to meet them and talk about their trip. They're only a few months in, so it's still all new to them and gives us a fantastic glimpse into where we hope to be before too terribly long. Cassie working on her triceps so she can keep pulling up that manual anchor. Prepping for Shake Down - wifi, dinghies and safety netting, oh my. At least I guess that's what you'd call it - a shake down sail? We have 3.5 weeks in December that are FREE! Free of work, free of school, free of any obligations. We are heading South! We don't really have a plan. I figure with that long we can spend 1 week sailing South - looking for sun, and then redetermine from there. I want to have plenty of time to get back - in case weather doesn't cooperate, etc, before work starts back up for both of us and school starts back up for me. But I'm really looking forward to getting out and sailing - just the two of us,and our little weenies. In the meantime, we're in prep mode! We've got the safety netting up for the dogs and it's working nicely. We picked up a 2nd dog life jacket, so we no longer have to choose which dog gets to live when we go for a sail. And we brought the dinghy to the dock and the motor is working - so we're mobile! Davits have been ordered (from two different companies! Oops. Got that straightened out though) and will be installed asap. Safety netting has been installed around the cockpit to keep the dogs from sliding off when we're heeling. Not only is the engine here, but we've also got it mounted in its home on the stern. A wifi booster - still have no clue which one to go with, but need to get it ordered/installed/learn to use it soon! Serious provisioning. This is a test run, so I want to practice provisioning for longer stints. While we will have easily accessible stores along the ICW, relative to being out in the ocean, I want to see if I can provision without needing to count on the stores. But it will be nice to know they're there for backup! The chart plotter may or may not be dead. It went out yesterday mid-sail, but Mark seems to have revived it. Looks like maybe a corroded wire... Hard to believe, right? Corrosion on a boat. Thinking of getting the Navionics app for my phone as a backup. I did not like sailing around without our chart plotter - at least we were in home waters and know the channel/sand bars here. Sleeping bags! Holy smokes it got cold here Friday night. Apparently these crazy Canadians brought their native weather with them. We have a heater, but won't have the luxury at anchor, so we'll need to bring along a couple of our sleeping bags, just in case. We are heading to the boat show in Miami in February, so we want to only purchase the necessities for now. We want to see what's out there before we make any big purchases. I'm thinking we can get so much more for the money, technologically, than could be had when the current systems were purchased in 2007. We'd like to have AIS and radar before we shove off the dock for good. And after we noticed our crazy water consumption this week, maybe a water maker! We're working on our consumption rates, as well, but we'll see how that goes. No clue yet where to stick a water maker on this sucker. It's freezing around here. That's not really a frequent occurrence waaay down here in Savannah, GA. But it's a great excuse to make a big ole pot of chili - boat style! I found a big pot on board (we still find random things stashed around everywhere) and got to work. It's really an easy thing to throw together with stuff you probably have on your boat (and if you don't maybe you can add it, depending on your location). I started by browning some ground beef (season with salt and pepper), but this could just as easily be all veggie by skipping this step. Next up, added some roughly chopped red onion and let that soften. I have a few cans of beans that I keep on the boat - today I opted for light red kidney beans, a packet of chili seasoning, freeze dried garlic and a can of diced tomatoes. I keep tomatoes on the boat, too - I like to whip up a batch of tomato bisque every now and then. You could use any type of canned tomato item - sauce, diced, whole, etc. I also keep at least one tube of double concentrated tomato paste and added a good squirt of that to make a more tomato-y sauce. After that you can just let it simmer. If you want it spicier, you can add some cayenne or crushed red pepper (I added both!). I've been looking for some art form that I can do on Luna Sea. That's a little more complicated than I imagined... I need storage space, accessibility to supplies, room to work, and the ability to photograph the work when it's done. I'm officially a painter - per my degree, but I do a lot of fabric dying and hand dyed silk scarves that sell in a boutique here in Savannah. But there's just no room for painting. And the chemicals that I have to use/dispose of to dye the fabrics? Forget about it! And storage of blank/painted canvases or bulk amounts of fabric? It's just not going to happen. I've spent a couple of months thinking about what I want to do. It needs to be small. It needs to be tedious (it's an active sort of meditation for me - you know, that feeling you get when you get sucked into a project and don't even realize how much time has passed. This also happens when I play video games, but hey - there's not really a market for that.) I finally decided to research bracelet/jewelry making. It's small. It's tedious. I requires minimal storage for plastic containers. I can mail the tiny packages from anywhere in the world. And most exciting to me? I can find beads/charms/inspiration in any corner of the world - this can work when we sail away! I've made about 15 so far and just opened an Etsy shop. I'd love some feedback. I'm trying to keep it affordable - but they are hand beaded originals, so a profit would be nice. Every pirate needs a skull bracelet. It's quiet here on dock. It's chilly enough that the "fun" boaters are all home until Spring. The only people out on the water at this early hour are the crabbers checking their traps. As I sit here below, doing my homework with the companionway doors open, I can hear as dolphin swim by - blowing as they come up for air. I took a homework break, grabbed the always-present camera and headed up to see if I could sneak a peek. I counted at least 4. The engine has tiller steering and it is kinda wacky to me. I have to face the bow of the dinghy, put the tiller in my left hand and steer opposite of the way I want to go. Not that complicated. The gas is also in the handle and it seems backwards to me. So along with moving the tiller to the right in order to go left, I have to twist the handle one way or the other to speed up and slow down. And don't forget that I can't actually slow down too much or the engine dies... It'll just take practice. I need to keep going out until it becomes second nature. Don't want to accidentally turn into an oncoming boat and speed up when I'm trying to slow down and turn away. We also saw a dolphin or two when we were out. I've been up close and personal with dolphins before, so I know how enormous they actually are - but you forget that when you're on a 40ft sail boat. When one of the dolphins surfaced right behind the tiny dinghy it was a nice reminder of how gargantuan they really are. Here's a little video proof that the dinghy is up and around. We now have the freedom to get to land when we're anchored out! Having to take the SUPs with us every time and paddle the dogs to distant shores for a pee break is over. Now we just have to figure out which davit system we're going with and get that sucker strapped to the back of LunaSea. Only about 6 weeks before we set sail for 3 weeks! Ever have a diary or something when you were a kid - and then go back and read is ages later? Yeah, well, I didn't. I'm not the diary type. And I'm not a hoarder, so even if I did have one, it would be long gone by now. But I get a kick out of writing this blog and reading the zillions I follow. Because of that, and because I was bored last year and wanted a healthy place to focus my attention (the couch gets really boring sometimes.) I started a now-defunct blog - Balance Your Journey. It had healthy posts about exercise and eating with a vegan recipe or two and some crazy new exercise trends I was trying when I wasn't sitting on the couch. But the interesting part (to me, a year later) was the page someone asked me to write explaining a little bit about myself. I've posted it below - and added updates to it out to the side. Where to begin? How about with that title up there. Balance Your Journey. Isn't that what life is all about? I think so - I'm a big fan of balance. From the literal to the figurative, I try to balance all aspects in my life. I am in culinary school - just for fun! 2 - SUP is one of those crazy fun ways to stay in shape while soaking in the beauty of Savannah, GA - and anywhere else I drag that big ole board. 11 - I also LOVE to read! I'll be posting good reads as I run across them. I'm a big fan of Historical Fiction, spirituality, healthy lifestyle, mystery, and even trashy beach romance novels. 12 - I have the coolest family ever. Hello, I'm Jennifer and I'm a food snob. Kinda. I have been trying hard to buy local and/or organic whenever possible because the nutrient content is higher. And the weird chemical content is lower. I don't like chemicals. Or preservatives. But what about on a boat? Mark was kind enough to remind me a while back that I can't just stop at a farmer's market in the middle of an ocean crossing. He's nice that way. 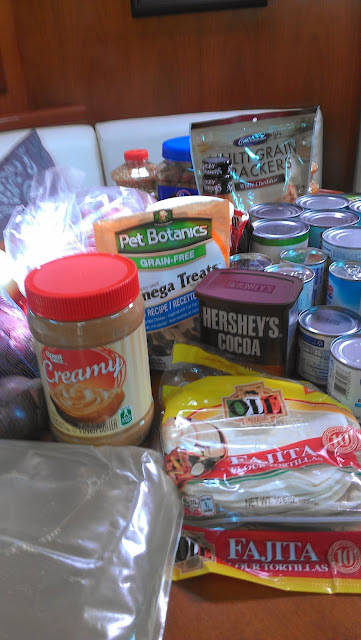 Since we're not ready to leave any time soon, and I am in no hurry to give up healthy eating, I'm researching/cooking with healthy yet boat-friendly foods. 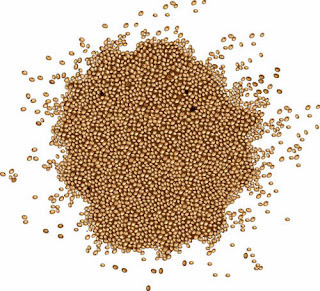 Today we're gonna talk about Amaranth. I'm sure, unless you live under a rock (or in the middle of an ocean) that you've heard of Quinoa by now. But what about amaranth? It is also a tiny, dry (great for a boat!) grain (technically quinoa is a seed, but whatever). 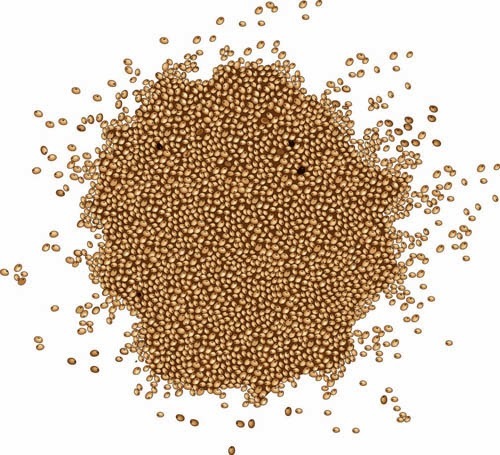 Amaranth is also a great veggie source of protein. I was able to find it at our local health food store in bulk for about $2.50/lb, as well as at Whole Foods - also in the bulk food section, at about the same price. That's a whole lot cheaper and easier to store on a boat than meat. But now I have to figure out what the heck to do with it. The general cooking rule is 2.5 to 1 - water to amaranth. It cooks up in about 20 minutes and has a wee bit of crunch at that time. You can apparently cook it a little longer and it becomes kind of like porridge. My first round is a little bland - but it seems to take on whatever flavors you cook it with, so it becomes a bit of a chameleon in the kitchen. The bowl I'm having for lunch was cooked with salted water (needs a little more salt) and an Italian spice blend. I added fresh tomatoes, garlic and a jar of artichoke hearts during the last few minutes of cooking and then topped with mozzarella cheese. It's pretty darn tasty. 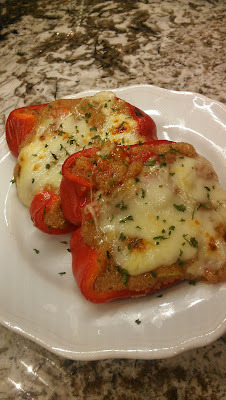 I've stuffed a red pepper with it for Mark's dinner tonight. It's gluten free, a great source of lysine and iron, has a decent (and absorbable) calcium content, 1 cup has 18 grams of fiber vs 2.4 in white rice, and is a good source of vitamin E/polyunsaturated fats (similar to olive oil). Anybody out there tried it/have a great recipe using it? I'm sure there are a million ways to cook it and am ready to start trying them all. Can't wait to attach it to something other than a step stool. Pretty much no sleep last night (Friday). I've mentioned a couple of times that I'm working on adding memory foam to the berths and recovering them. They seem to have the original foam and definitely have the original striped Beneteau fabric. Ideally, I will replace all of the original "charter" fabrics (salon pleather, mainsail cover, bimini, outdoor cushions and all the green, navy and maroon striped stuff throughout), but for now I'm just trying to annihilate the stupid dust mites that are clearly (per my lungs) stowing away on Luna Sea. Last Sunday, after nursing a sick LibbyLou back to health, I managed to get the memory foam cut to fit the forward berth, as well as the fabric cut to cover the aft starboard berth. The aft berth has two cushions in it - and I've already covered the smaller one with this weird outdoor fabric that I found at WalMart for a steal. I'm using pinking shears for all of my cuts to reduce the risk of fraying threads. I'm reusing the breathable backing and zippers. I don't think I'd ever sewn a zipper before that small cushion. The larger cushion that I did manage to get fabric cut for last weekend. I am pretty allergic to dust mites. I've learned over the past few years that almost anytime I feel sickly, it's because of these tiny little suckers. They live everywhere - well, in pretty much any fabric that can breathe -sheets, cloth pillows, rugs, mattresses, etc. The only way you can get rid of them is to wash the fabric in hot water - or not use/have fabrics that are dust mite friendly. That brings me back to the weird WalMart Fabric. It's tan - so it doesn't look weird, but it has some sort of plastic-y waterproof barrier on the inside of the fabric. It's a little coarse, so I hope it softens up a bit with use - but I'll put sheets on it anyway, so hopefully it's a moot point. 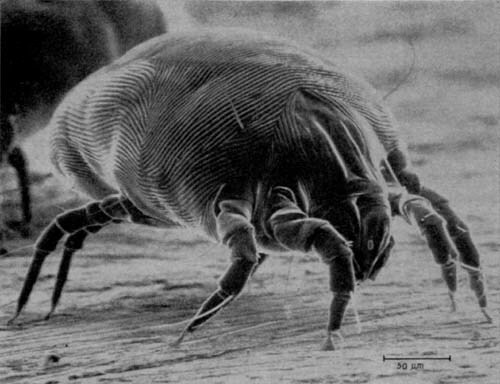 I don't think the dust mites can really get through it - maybe it will slow them down, at the least. I woke up a little wheezy (apparently they are the cause of my occasional asthma attacks), with a scratchy throat. And tired. If I didn't know better, I'd say I'm coming down with something. But I do know better. So instead, I've whipped out my already cut fabric and gotten to work on finishing the aft berth. This girl is sleeping dust mite free tonight! I did manage to get the fabric for the top of the bigger cushion sewn Saturday morning before we sailed off, but we opted for fun over work (yay!) so the backing/zipper project was saved for Monday. I spent a few hours on Luna Sea yesterday finishing up the aft cabin - and it should now provide relatively dust-mite-free sleep! We headed off to Luna Sea late this morning to finish off a few projects and visit with friends and boat neighbors. 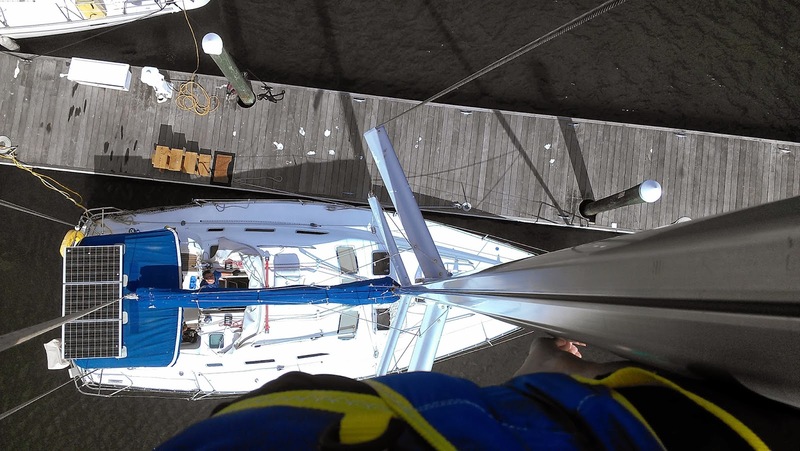 Then I headed on up the mast for some de-rustification. (That's a word, right?) Translation: I strapped on that adorable bosun's chair, hooked into the main halyard, and Mark had the privilege of winching me on up. He only complained a little - and was smart enough to choose his words carefully. Figured I oughta take a couple of shots from above - here's that .29 mile hike I used to whine about allllll the way to the parking lot. There's Mark's noggin' poking out from under the boom. So that whole mast event was really fun. I was even able to swing around a little and pretend I was an acrobat. Maybe I should add an electric winch to the list so I can talk Mark into sending me up there more often. Mark also hung up the safety net to keep the wiener's from sliding off the boat - but I forgot to take pics. (It's always best to keep your wieners contained.) I'll just have to post on that another time. Happy Sunday! Another First - a weekend in pictures. We had another First this weekend - we headed out to meet some friends in Wassaw Creek to raft up for an over-night trip. We've done one over-nighter before, but we were alone. Saturday morning Mark headed off for his 60 mile bicycle ride while I prepped for the boat then we grabbed a quick lunch and loaded up. Our friends on Tammy Ann headed out an hour or two before us, so we just shoved off when we were ready and headed their way. The winds were light, we motored most of the way. We headed down the river, into the ocean then around Wassaw and in at Odingsell. It took about 4 hours - and we didn't go that far, via a map. But it was a great distance for an easy, relaxing overnight. We got rafted up to our friends and settled in with drinks and a snack in plenty of time to enjoy the setting sun. The first time we've rafted up - they had their anchor out and we were just tied to them. Made for a peaceful night of sleep - the anchor was their responsibility! Our single, unknown neighbor - a hefty catamaran down the creek a-ways. After a shared brunch, we all packed up and shoved off around noon to head back. Still light winds, but a little more sailing. The deepest part of the channel runs right along the beach - had to really hug it during low tide. It completely throws me off when that happens - you would think it would be shallow there. Tammy Ann cruising along under sail power. Libby is feeling much better this week. We were being stalked back to the marina. These guys flew right up to the pod, then wondered where the went... (they were behind the boat - the dark section 1/3 of the way between the edge of the photo and the boat.) You are not supposed to drive within around 50 yards of the dolphins. They can come up to you, but you're not supposed to go up to them. Silly power boaters. I've noticed an unfortunate pattern. When we have a hard time leaving the dock, it's a breeze getting back in. This weekend it was a breeze leaving and a bugger getting back in. Oh well, no boats were hurt, we just entertained the folks at the dock for a while.